Background The authors consider whether differences in stage at diagnosis could explain the variation in lung cancer survival between six developed countries in 2004–2007. Methods Routinely collected population-based data were obtained on all adults (15–99 years) diagnosed with lung cancer in 2004–2007 and registered in regional and national cancer registries in Australia, Canada, Denmark, Norway, Sweden and the UK. Stage data for 57 352 patients were consolidated from various classification systems. Flexible parametric hazard models on the log cumulative scale were used to estimate net survival at 1 year and the excess hazard up to 18 months after diagnosis. Results Age-standardised 1-year net survival from non-small cell lung cancer ranged from 30% (UK) to 46% (Sweden). Patients in the UK and Denmark had lower survival than elsewhere, partly because of a more adverse stage distribution. However, there were also wide international differences in stage-specific survival. Net survival from TNM stage I non-small cell lung cancer was 16% lower in the UK than in Sweden, and for TNM stage IV disease survival was 10% lower. Similar patterns were found for small cell lung cancer. Conclusions There are comparability issues when using population-based data but, even given these constraints, this study shows that, while differences in stage at diagnosis explain some of the international variation in overall lung cancer survival, wide disparities in stage-specific survival exist, suggesting that other factors are also important such as differences in treatment. Stage should be included in international cancer survival studies and the comparability of population-based data should be improved. Do differences in stage at diagnosis explain wide international differences in lung cancer survival? Differences in stage at diagnosis explain some of the international variation in lung cancer survival, but wide disparities in stage-specific survival suggest that other factors such as treatment are also important. This is the first international population-based study of lung cancer survival by stage at diagnosis and includes nearly 60 000 patients. We describe how far stage explains international inequalities in lung cancer survival. Understanding why these survival differences occur will facilitate policy designed to bring survival up to the highest international standard. Stage at diagnosis is an important prognostic factor, and international population-based studies suggest that differences in stage explain some of the survival variation for several cancers, including the ICBP study for ovarian cancer.9–12 Few such studies exist for lung cancer, although stage explains some of the survival differences between Nordic countries13 and within countries over time.2 In this study, using population-based data, we investigate whether lung cancer survival differences may be attributable to differences in stage at diagnosis, reflecting delays in diagnosis or differences in staging procedures, or to differences in stage-specific survival which could indicate differences in treatment, staging or comorbidity. Clinical trials are the gold standard for testing the efficacy of new therapies, but they usually exclude elderly, frail and socially marginalised patients. Trials cannot be used for international comparisons of the effectiveness of entire health systems to underpin public health policy: population-based data on the survival of all patients are required. Analyses were restricted to the period 2004–2007 (232 278 patients) when stage data were more complete, and further to registries where at least 50% of patients were staged, thereby excluding Ontario, Victoria, Wales and six of the eight regional registries in England. A total of 57 352 patients were finally included in the analyses. We requested stage data in three separate fields on the extent of the tumour (T), the degree of nodal involvement (N) and the presence of metastases (M), coded to the TNM classification.14 We prioritised pathological T and N and clinical M where both clinical and pathological data were available. Norway and New South Wales provided a locally-defined stage classified as ‘local, regional, distant’. In order to include Norway and New South Wales in the comparisons, we mapped the TNM system used in the four other countries to the US Surveillance, Epidemiology and End Results Summary Stage 2000 classification (SEER),15 which is similar to both the Norwegian and the New South Wales ‘localised, regional, distant’ classifications, but better documented and more widely known.16 This mapping was straightforward where we had information on each of T, N and M, but it was not possible for England which only provided a grouped TNM stage (I–IV). We therefore present two sets of analyses: one in which stage is categorised to the TNM classification system, which may be more relevant for clinicians but excludes Australia and Norway, and another in which stage is classified as ‘localised, regional, distant’ (SEER), which excludes England. We examined non-small cell (NSCLC) and small cell lung cancer (SCLC) separately because of their different aetiology and clinical behaviour. NSCLC represents over 80% of lung cancers, and we included non-microscopically verified tumours in this group. NSCLCs grow more slowly and are generally more amenable to treatment, whereas SCLC is more aggressive although short-term survival can be extended with chemotherapy. We first treated patients with missing stage as a separate category. Multiple imputation by chained equations was then conducted to include patients with missing stage in the analyses using the Stata command ice19 (web appendix para 3). We ran the imputation model 15 times and combined the results under Rubin's rules.19 We then re-estimated stage-specific survival using the 15 imputed datasets by repeating the survival analysis modelling strategy described above, and compared the range of survival estimates with the estimates for patients with known stage. We present survival estimates by age, stage and country. All-ages estimates were standardised using stage-specific weights based on the age distribution observed across all countries (see online web appendix, tables 1 and 2). Men represented between 52.3% (Sweden) and 62.2% (Australia) of all patients (table 1). In the UK, 26.0% of tumours were not microscopically verified compared with 5.2% in Sweden (table 1). Among microscopically-confirmed tumours, the percentage of SCLC varied from 12.9% in Australia to 18.0% in Norway. The proportion of adenocarcinomas ranged from 25.2% (UK) to 44.8% (Sweden). The age distribution at diagnosis was similar in all countries, with mean age about 70 years (table 2). Patients for whom information on stage at diagnosis was missing tended to be older (mean age about 73 years). Patients diagnosed at a more advanced stage tended to be younger than those diagnosed at an earlier stage, and older patients were more likely to be missing data on stage (see online web appendix figure 1). The UK had the highest proportion of patients for whom data on stage (TNM) at diagnosis were missing, both for NSCLC (30.3% vs 5.6–11.2% elsewhere) and for SCLC (38.4% vs 2.1–8.2%). The proportion was also relatively high in Australia (SEER), both for NSCLC (23.4%) and SCLC (18.6%) (table 2). Lung cancer is generally diagnosed at an advanced stage. For NSCLC, the proportion with metastatic disease (TNM stage IV) ranged from 46.8% in Sweden to 55.0% in Denmark, or (SEER ‘distant’) from 47.5% in Australia to 61.2% in Denmark. The proportion of early stage NSCLC was lowest in Denmark and the UK. For SCLC, 72.1% of patients in Denmark had metastatic disease (TNM stage IV) compared with less than 66% elsewhere. For SEER ‘distant’, the proportion ranged from 61.3% in Australia to around 82% in Denmark and the UK (table 2). Imputing TNM or SEER stage where it was missing did not consistently shift stage distribution towards a more or less advanced stage. The increase in the proportion of TNM stage IV was 0.2–2.6% for patients with NSCLC (table 2) and −1.1% to +0.3% for those with SCLC. Overall age-standardised 1-year net survival from NSCLC ranged from 30% in the UK to 46% in Sweden (table 3). Survival was also high (42%) in Australia and Canada and intermediate (34–39%) in Denmark and Norway. Overall estimates differ slightly between the TNM and SEER analyses because patients in England were only included in the TNM analyses (40% of all TNM-staged patients) and Australian and Norwegian patients were only included in the SEER analyses (38% of all SEER patients). These exclusions affect the model results for the other countries. One-year survival for patients with TNM stage I and II disease was significantly lower in the UK (stage I: 72.5%; stage II: 59.8%) and Denmark (stage I: 73.3%; stage II: 59.1%) than in Canada (stage I: 86.3%; stage II: 78.5%) and Sweden (stage I: 88.4%; stage II: 70.7%) (table 3). Survival was also lower in the UK for stage III (35.3% vs 42.8–46.4% elsewhere) and stage IV (15.9% vs 20.8–25.6% in Denmark and Sweden). The apparent survival advantage in Canada for early stage NSCLC was not evident at more advanced stage, and survival for stage IV disease was 16.8%, similar to that for patients in the UK. For TNM stages I–II, the excess hazard in the UK and Denmark was higher than in Canada and Sweden at all time points up to 18 months, but the differences were widest soon after diagnosis, narrowing over the first year (figure 1). The excess hazard for stages III–IV NSCLC was consistently high in the UK. 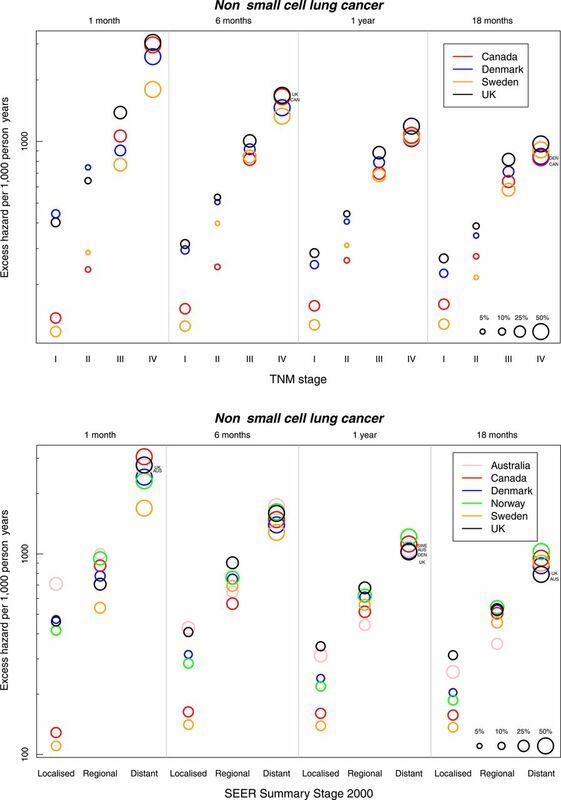 Age-standardised excess hazard (per 1000 person-years, log scale) from non-small cell lung cancer by stage, country and time since diagnosis: TNM stage (upper panel) and SEER Summary Stage 2000 (lower panel). Notes: (1) National data are used for Denmark and Norway. Other countries are represented by regional registries (Australia: New South Wales; Canada: Alberta and Manitoba; Sweden: Uppsala-Örebro and Stockholm-Gotland health regions; the UK (TNM analysis): West Midlands Cancer Intelligence Unit, the Eastern Cancer Registration and Information Centre in England and Northern Ireland; the UK (SEER analysis): Northern Ireland). (2) Bubbles are scaled to represent stage distribution at diagnosis. Patients with ‘localised’ NSCLC in Australia had low survival, but survival for more advanced disease was average (table 3, figure 2). The excess hazard for Australian patients with ‘regional’ NSCLC declined more steeply with time than in other countries (figure 1). Norwegian patients had average stage-specific survival (table 3). Age-standardised 1-year net survival from non-small cell lung cancer by stage at diagnosis and country using known stage and imputed stage: TNM stage (upper panel) and SEER Summary Stage 2000 (lower panel). Notes: Australia: New South Wales; Canada: Alberta and Manitoba; Sweden: Uppsala-Örebro and Stockholm-Gotland health regions; the UK (TNM analysis): West Midlands Cancer Intelligence Unit, the Eastern Cancer Registration and Information Centre in England and Northern Ireland; the UK (SEER analysis): Northern Ireland. The inclusion of patients with imputed stage made no material difference to the survival patterns (figure 2). One-year age-standardised net survival from SCLC ranged from 24.9% in the UK to 36.6% in Sweden (TNM analyses), and from 23.1% in the UK to 38.7% in Sweden in the SEER analysis (table 4). The estimates differ because patients in England (38% of all patients) were only included in analyses by TNM stage, while Australian and Norwegian patients (38% of all patients) were only included in analyses by SEER stage. Among patients with early stage SCLC (TNM stages I and II), survival was lower in the UK (55.9%) and Denmark (64.5%) than in Canada (71.1%) and Sweden (71.7%) (table 4). The UK had lower survival among patients with stage III (37.3% vs 47.9–52.2%) and stage IV disease (14.4% vs 17.9–27.6%). The excess hazard of death for UK patients with stage III SCLC was very high immediately after diagnosis but became average by 18 months (figure 3). Among patients with stage IV disease, the excess hazard in the UK and in Canada was high throughout the first 18 months. 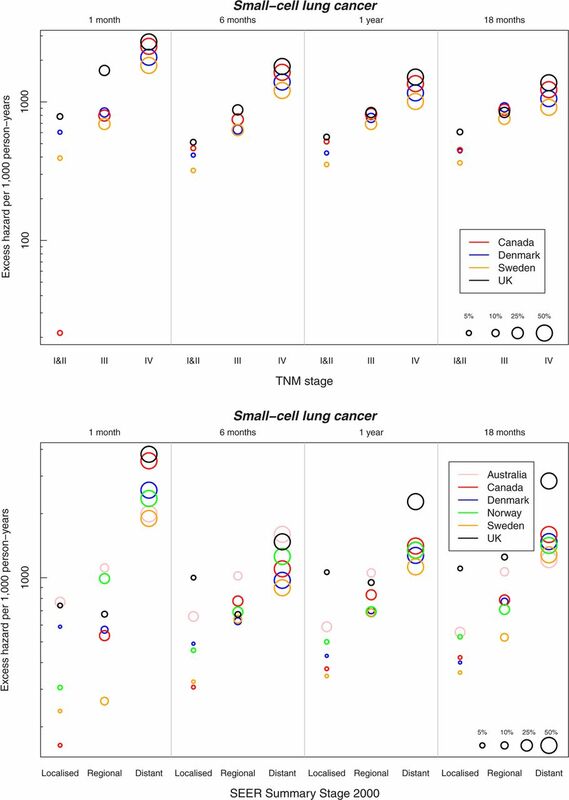 Age-standardised excess hazard (per 1000 person-years, log scale) from small cell lung cancer by stage, country and time since diagnosis: TNM stage (upper panel) and SEER Summary Stage 2000 (lower panel). Notes: (1) National data are used for Denmark and Norway. Other countries are represented by regional registries (Australia: New South Wales; Canada: Alberta and Manitoba; Sweden: Uppsala-Örebro and Stockholm-Gotland health regions; the UK (TNM analysis): West Midlands Cancer Intelligence Unit, the Eastern Cancer Registration and Information Centre in England and Northern Ireland; the UK (SEER analysis): Northern Ireland). (2) Bubbles are scaled to represent stage distribution at diagnosis. Norway had average survival for patients diagnosed at each SEER stage, and the excess hazard was generally average throughout follow-up (figure 3). Patients in Australia had quite low stage-specific survival from SCLC (table 4). The range in the excess hazard between SEER stages was narrower in Australia than in other countries throughout follow-up (figure 3). Survival estimates including patients with imputed stage were generally close to those for patients with known stage. 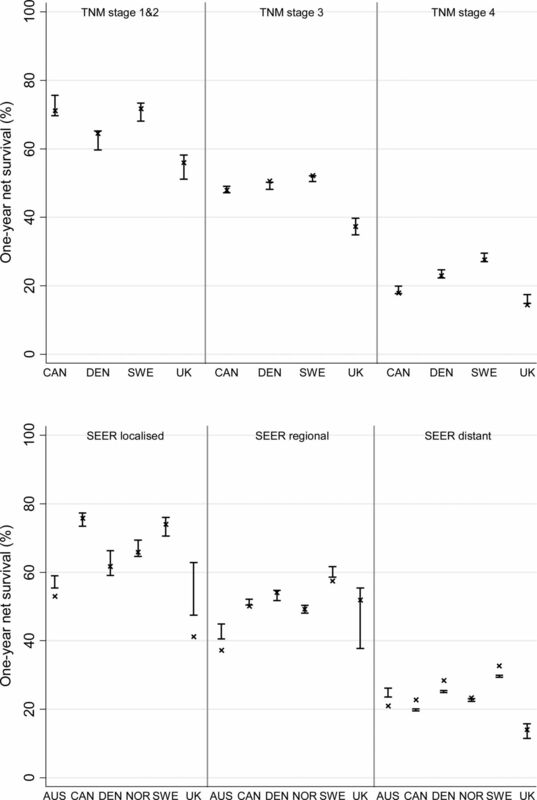 The main exception was for the UK (Northern Ireland only) in the SEER analyses, where the number of patients was small (figure 4). Age-standardised 1-year net survival from small cell lung cancer by stage at diagnosis and country using known stage and imputed stage: TNM stage (upper panel) and SEER Summary Stage 2000 (lower panel). Notes: Australia: New South Wales; Canada: Alberta and Manitoba; Sweden: Uppsala-Örebro and Stockholm-Gotland health regions; the UK (TNM analysis): West Midlands Cancer Intelligence Unit, the Eastern Cancer Registration and Information Centre in England and Northern Ireland; the UK (SEER analysis): Northern Ireland. Lung cancer survival varied widely between these six wealthy countries in 2004–2007. Age-standardised 1-year net survival for NSCLC ranged from 30% in the UK to 46% in Sweden. Survival was relatively low in Denmark, intermediate in Norway and high in Australia and Canada. For SCLC, 1-year survival was 12–16% lower in the UK than in Sweden and Australia and intermediate elsewhere. These survival differences are partly explained by differences in stage at diagnosis. Denmark in particular had a more adverse stage distribution. However, international differences in survival were also evident within each stage of disease for both types of lung cancer: generally low in the UK and high in Sweden. Denmark had low survival for patients with early stage disease but average survival for those with more advanced disease while, in Canada, the comparatively high survival for early disease was not apparent for patients with more advanced disease. International differences in stage at diagnosis may arise because of differences in disease aetiology (which may affect the aggressiveness of disease), or delays in diagnosis or in the staging procedures themselves. Stage-specific survival may also vary because of differences in the quality of and access to stage-specific treatment. Population-based survival estimates are invaluable for public health surveillance because they include all patients—young and old, rich and poor, with early or late disease and with or without comorbidity—not just the small percentage of younger, fitter patients typically recruited to clinical trials. This study was based on 57 352 unselected patients with lung cancer from population-based registries. Low stage-specific survival in the UK could conceivably arise in part because of suboptimal staging, and this misclassification of stage in a proportion of patients could lead to inappropriate treatment and therefore overall lower survival. In order to understand the impact of different staging procedures on international differences in survival, cancer registries will need to capture information on the staging procedures used for each patient—for example, whether sensitive investigations such as positron emission tomography (PET)-CT were used—enabling patients with very low volume metastatic NSCLC to be correctly identified as having advanced disease, or whether liver function tests were used to identify advanced stage SCLC. At the very least, registries should record whether the recorded stage was defined clinically (based on physical examination, imaging or endoscopy) or following histological examination. We used standard approaches to deal with other potential biases that face all international comparisons of cancer survival using population-based data, such as age standardisation to control for differences in the age distribution.25 Nonetheless, some compositional differences remained: men made up over 59% of the patients in Australia, Norway and the UK compared with less than 54% elsewhere, and men generally have lower lung cancer survival than women.26 The histological subtypes of lung cancer also varied. Non-microscopically verified cancers were grouped with NSCLC, but those could have included some patients with SCLC or misdiagnosed cancer. Any effect would have been small, but probably more important in the UK which had the lowest proportion of patients with histological confirmation (74.0%). The UK also had the lowest proportion of adenocarcinomas, which have a better prognosis, and this was true even after imputing morphology where it was missing (results not shown). However, survival from NSCLC in the UK was also comparatively low for each stage of disease. Compared with Sweden, 1-year survival in the UK was statistically significantly 10–16% lower within each TNM stage I–IV and 9–19% lower than in Canada for stages I–III (survival for stage IV was low in Canada). Danish patients had low stage-specific survival for TNM stages I–II. Patients in the UK also had lower overall survival from SCLC despite the relatively favourable stage distribution, because stage-specific survival at each stage was generally lower than elsewhere. Low stage-specific survival may indicate poorer levels of stage-specific treatment. Previous studies have shown that surgery for lung cancer is less frequently performed in the UK31 ,32 than elsewhere in Europe33 ,34 or Canada.20 ,35 Similarly, lower provision of chemotherapy and radiotherapy has been reported in the UK32 than in Australia,36 Canada20 and Sweden.34 These studies are not directly comparable because they use different methods, data and calendar periods. The overall pattern is nevertheless suggestive of the need for wider access to optimal treatment. We are currently examining how far differences in treatment between the six ICBP countries may explain the variation in survival. Other explanations that may be considered include factors such as obesity, smoking, performance status and comorbidity. It would be desirable to have data on these factors, which may be more common in the countries with lower overall survival,33 but such factors would have to be both highly prevalent and powerfully prognostic to explain the survival differences between countries reported here. Clinical choices may also be more conservative in some countries than others in the face of comorbidities, older age and lower performance status. This study demonstrates wide differences between six wealthy countries in short-term survival from lung cancer, the most common cause of cancer death worldwide. These differences seem unlikely to be explained by artefacts of method or unrecorded confounders, and differences in stage at diagnosis and stage-specific treatment are likely to be important explanations. The study also shows the importance of including stage at diagnosis in international survival comparisons. It is essential that the quality, completeness and comparability of stage data are improved, both in clinical settings and in population-based cancer registries, in order to facilitate surveillance of international trends in survival. Such comparisons incentivise policy development and act as benchmarks for setting national cancer plans. We thank the cancer registry staff in all jurisdictions, whose sustained efforts in data collection and quality control over many years have enabled lung cancer survival to be compared by stage at diagnosis. The authors would like to thank Martine Bomb, Catherine Foot and Donia Sadik at Cancer Research UK for their logistical support. World Cancer Report. Lyon, France: International Agency for Research on Cancer, 2008.
. The changing epidemiology of lung cancer in Europe. Lung Cancer 2003;41:245–58.
. Cancer survival in Africa, Asia, the Caribbean and Central America. Lyon: International Agency for Research on Cancer, 2011.
. Cancer survival in five continents: a worldwide population-based study (CONCORD). Lancet Oncol 2008;9:730–56.
. Survival for eight major cancers and all cancers combined for European adults diagnosed in 1995–99: results of the EUROCARE-4 study. Lancet Oncol 2007;8:773–83. Department of Health. Improving outcomes: a strategy for cancer. London: Department of Health, 2011.
. What if cancer survival in Britain were the same as in Europe: how many deaths are avoidable? Br J Cancer 2009;101(Suppl 2):115–24.
. Cancer survival in Australia, Canada, Denmark, Norway, Sweden, and the UK, 1995–2007 (the International Cancer Benchmarking Partnership): an analysis of population-based cancer registry data. Lancet 2011;377:127–38.
. Survival differences between European and US patients with colorectal cancer: role of stage at diagnosis and surgery. Gut 2005;54:268–73.
. Stage at diagnosis is a key explanation of differences in breast cancer survival across Europe. Int J Cancer 2003;106:416–22.
. Large differences in patterns of breast cancer survival between Australia and England: a comparative study using cancer registry data. Int J Cancer 2009;124:2391–9.
. Stage at diagnosis and ovarian cancer survival: evidence from the International Cancer Benchmarking Partnership. Gynecol Oncol 2012;127:75–82.
. Do morphology and stage explain the inferior lung cancer survival in Denmark? Eur Respir J 1999;13:430–5.
. TNM classification of malignant tumours. 7th edn. Oxford: Union for International Cancer Control (UICC), Wiley-Blackwell, 2009.
. SEER summary staging manual—2000: Codes and Coding Instructions. NIH Pub. No. 01-4969. Bethesda: National Cancer Institute, 2001.
. Comparability of stage data in cancer registries in six countries: lessons from the International Cancer Benchmarking Partnership. Int J Cancer 2013;132:676–85.
. Further development of flexible parametric models for survival analysis. Stata J 2009;9:265–90.
. An overall strategy based on regression models to estimate relative survival and model the effects of prognostic factors in cancer survival studies. Stat Med 2007;26:2214–18.
. The descriptive epidemiology of primary lung cancer in an Alberta cohort with a multivariate analysis of survival to two years. Can Respir J 2003;10:435–41.
. Temporal trends in non-small cell lung cancer survival in Sweden. 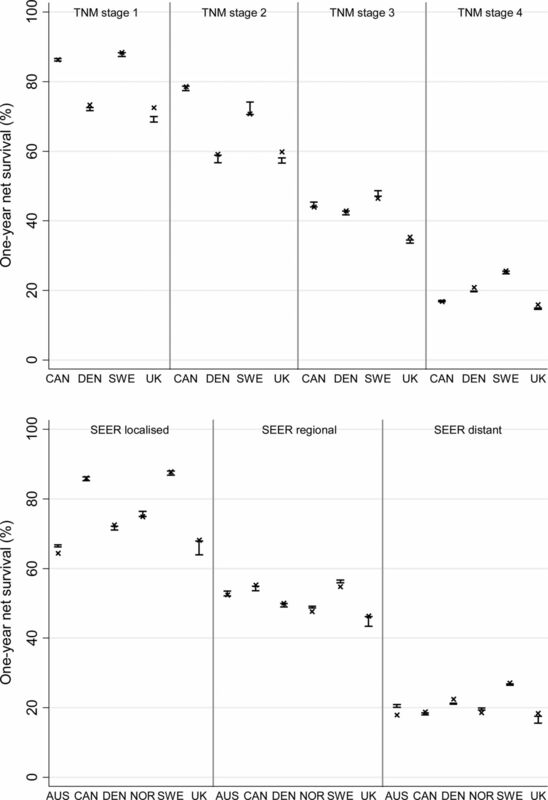 Br J Cancer 2007;96:519–22.
. National comparisons of lung cancer survival in England, Norway and Sweden 2001–2004: differences occur early in follow-up. Thorax 2010;65:436–41. Lungcancer i Sverige: Nationellt register för lungcancer. Regionala jämförelser 2002–2008. http://www.vinkcancer.se/Global/Diagnoser/lungcancer/rapporter/NLCR_rapport_02_08_reg_jamforelser.pdf (accessed 20 Feb 2012).
. The influence of age on management of lung cancer patients in England (abstract). Thorax 2010;65:167–8.
. International comparisons of survival from lung cancer: pitfalls and warnings. Nat Clin Pract Oncol 2007;4:570–7.
. The advantage of women in cancer survival: an analysis of EUROCARE-4 data. Eur J Cancer 2009;45:1017–27.
. The completeness of the Swedish Cancer Register—a sample survey for year 1998. Acta Oncol 2009;48:27–33. World Health Organisation. WHO Report on the Global Tobacco Epidemic. Geneva, Switzerland: 2008.
. Delay in diagnosis: the experience in Denmark. Br J Cancer 2009;101(Suppl 2):5–8.
. The National Awareness and Early Diagnosis Initiative in England: assembling the evidence. Br J Cancer 2009;101(Suppl 2):1–4. National Cancer Intelligence Network. Major surgical resections England, 2004–2006. London, UK: National Cancer Intelligence Network, 2011. NHS Information Centre (NHSIC). National Lung Cancer Audit 2010. Report No: IC03020211. Leeds: NHSIC, 2011.
. Lung cancer in Teesside (UK) and Vares (Italy): a comparison of management and survival. Thorax 2006;61:232–9.
. Regional differences in treatment and outcome in non-small cell lung cancer: a population-based study (Sweden). Lung Cancer 2009;63:16–22.
. Improved survival from lung cancer in British Columbia compared to Scotland-are different treatment rates the whole story? Lung Cancer 2009;64:358–66.
. Why do some lung cancer patients receive no anticancer treatment? J Thorac Oncol 2010;5:1025–32. Collaborators ICBP Module 1 Working Group: Programme Board—Søren Brostrøm (Danish National Board of Health, Hospital Services and Emergency Management, Copenhagen, Denmark); Heather Bryant (Canadian Partnership Against Cancer, Toronto, Ontario, Canada); David Currow (Cancer Institute New South Wales, Sydney, New South Wales, Australia); Anna Gavin (Northern Ireland Cancer Registry, Belfast, UK); Gunilla Gunnarsson (Swedish Association of Local Authorities and Regions, Stockholm, Sweden); Jane Hanson (Welsh Cancer National Specialist Advisory Group, Cardiff, UK); Todd Harper (Cancer Council Victoria, Carlton, Victoria, Australia); Stein Kaasa (University Hospital of Trondheim, Trondheim, Norway); Michael A Richards (National Cancer Action Team, Department of Health, London, UK); Michael Sherar (Cancer Care Ontario, Toronto, Ontario, Canada); Bob Thomas (Department of Health Victoria, Melbourne, Victoria, Australia). Module 1 Collaborators and Cancer Registries—Jan Adolfsson (Regional Cancer Centre, Stockholm County Council and the CLINTEC Department, Karolinska Institutet, Stockholm, Sweden); Ole Andersen (National Board of Health, Health Planning Division, Copenhagen, Denmark); Heather Bryant (Canadian Partnership Against Cancer, Toronto, Ontario, Canada); Andy Coldman (Cancer Surveillance and Outcomes, British Columbia Cancer Agency, Vancouver, British Columbia, Canada); Dhali Dhaliwal (CancerCare Manitoba, Winnipeg, Manitoba, Canada); Gerda Engholm (Department of Cancer Prevention and Documentation, Danish Cancer Society, Copenhagen, Denmark); Anna Gavin (Northern Ireland Cancer Registry, Belfast, UK); David Forman (Section of Cancer Information, International Agency for Research on Cancer, Lyon, France); Marianne L Gjerstorff (Danish Cancer Registry, Statens Serum Institut—National Institute for Health Data and Disease Control, Copenhagen, Denmark); Juanita Hatcher (Alberta Health Services, Edmonton, Alberta, Canada); Charlotte Hosbond (National Board of Health, Copenhagen, Denmark); Tom B Johannesen (Norwegian Cancer Registry, Oslo, Norway); Mats Lambe (Regional Oncological Centre, Uppsala University Hospital, Uppsala, Sweden and the Karolinska Institutet, Stockholm, Sweden); Karen M Linklater (Thames Cancer Registry, London, UK); Loraine Marrett (Cancer Care Ontario, Toronto, Ontario, Canada); Colleen E McGahan (Cancer Surveillance and Outcomes, British Columbia Cancer Agency, Vancouver, British Columbia, Canada); John McLaughlin (Cancer Care Ontario, Toronto, Ontario, Canada); David Meechan (Trent Cancer Registry, Sheffield, UK); Richard Middleton (Northern Ireland Cancer Registry, Belfast, UK); Kamini Milnes (Cancer Care Ontario, Toronto, Ontario, Canada); Diane Nishri (Cancer Care Ontario, Toronto, Ontario, Canada); Nicola Quin (Cancer Council Victoria, Carlton, Victoria, Australia); Linda Rabenek (Cancer Care Ontario, Toronto, Ontario, Canada); Carol Russell (Alberta Health Services, Edmonton, Alberta, Canada); Janey Shin (Canadian Partnership Against Cancer, Toronto, Ontario, Canada); John Steward (Welsh Cancer Intelligence and Surveillance Unit, Cardiff, UK); Elizabeth Tracey (Cancer Institute New South Wales, Sydney, New South Wales, Australia); Donna Turner (CancerCare Manitoba, Winnipeg, Manitoba, Canada). Clinical Committee—Stefan Bergström (Department of Oncology, Central Hospital, Gävle, Sweden); Michael Boyer (Sydney Cancer Care Centre, Sydney, New South Wales, Australia); John Butler (Royal Marsden Hospital, London, UK); William Evans (Juravinski Cancer Centre at Hamilton Health Sciences, Cancer Care Ontario, Toronto ON, Canada); Louise Hanna (Velindre NHS Trust, Cardiff, UK); Erik Jakobsen (Odense University Hospital, Odense, Denmark); Karl Kölbeck (Karolinska University Hospital, Stockholm, Sweden); Jason Lester (Velindre NHS Trust, Cardiff, UK); Jonathan McAleese (Belfast City Hospital, Belfast, UK); Michael D Peake (NHS Cancer Improvement, National Cancer Intelligence Network, Department of Respiratory Medicine, Leicester, UK); Stein Sundstrøm (Department of Oncology, St Olavs Hospital, University Hospital of Trondheim, Trondheim Norway); Nicholas Young (School of Social and Community Medicine, University of Bristol, Bristol, UK); Ian Williamson (Royal Gwent Hospital, Newport, UK). Central Analytic Team—Sarah Walters, Camille Maringe, Michel P Coleman, Bernard Rachet (Cancer Research UK Cancer Survival Group, London School of Hygiene and Tropical Medicine, London, UK). Contributors Programme Board (SB, HB, DC, AG, GG, JH, TH, SK, MAR, MS and BT) identified the questions and the countries to be studied, supervised the study and contributed to drafting the report. Module 1 collaborators (JA, OA, HB, DF, AG, CH, TBJ, ML, MLG, DM, RM, NQ, LR, JS, JSt and ET) contributed to study design and drafting the report. Cancer registry contributors (JA, HB, AC, DD, GE, AG, MLG, JH, TBJ, CL, ML, KML, LM, CEM, JMcL, DM, RM, KM, DN, CR, JSt, JS, ET and DT) collected, prepared and transmitted the raw data, advised on the protocol, corrected data after quality control and checked the results of the analyses. Clinical Committee (SB, MB, JB, WE, LH, EJ, KK, JL, JMcA, MDP, SS, NY and IW) advised on methodology, helped interpret the findings and contributed to drafting the report. Central Analytic Team (SW, CM, MPC and BR) drafted the protocol, obtained statutory and ethics approvals, had access to all the raw data, did the data preparation, quality control and analyses and drafted the report. All authors had access to the results of all steps of data preparation, quality control and analyses and contributed to the final report. Funding This work was supported by the Department of Health, England. Cancer Research UK supports the Cancer Survival Group (C1336/A11700). The Northern Ireland Cancer Registry is funded by the Northern Ireland Public Health Agency. Competing interests MAR is the National Cancer Director (England, funded by the Department of Health). Other authors declare that they have no conflicts of interest. What exactly are we doing to improve low lung cancer survival in the United Kingdom?